Turtles are of the reptilian order Testudines (Chelonii), but the word Chelonian is popularly used by researchers to refer to all living and extinct turtles. Chelonians are reptiles that are characterized by their hard or soft shell, and include turtles, tortoises, and terrapins. While the three names are mistakenly used interchangeably, it's generally understood that turtles are aquatic or semi-aquatic, tortoises are primarily land dwellers, and terrapins live on land and in water, but they are mainly found in freshwater or swampy areas. Here in the Adirondack Park, turtles are our native members of the Chelonian family. Turtles are easily identifiable because of their distinct appearance. It is true not all turtle species look the same, but you can expect to see some type of shell covering a turtle's back. A turtle shell is actually made of two shells. The upper shell, the carapace, is hard and usually covered in keratin scutes (plates), which forms a symmetrical pattern. The lower shell, the plastron, is the part underneath a turtle, and it also has scutes. Typically, the plastron on a male turtle is concave, and if the turtle is a female, the plastron is convex. These shells are fused to the ribs and backbones of turtles, and the upper and lower shells are connected through bony bridges. Shells are also a turtle's greatest defense against predators because keratin is a hard protein. The most commonly found turtles in the Adirondack Park are the snapping turtle, the painted turtle, the spotted turtle, and the wood turtle. The common snapping turtle (snapper) is the largest freshwater turtle in New York State and one of the largest in all of North America. Found throughout the state, the snapping turtle was named the official reptile of New York in 2006. For a turtle, the snapper has a much larger head, a long, saw-toothed tail, and stocky legs with sharp claws. The "snapping" part of its name comes from its hooked beak, which it can use to snap at predators with surprising speed and power. 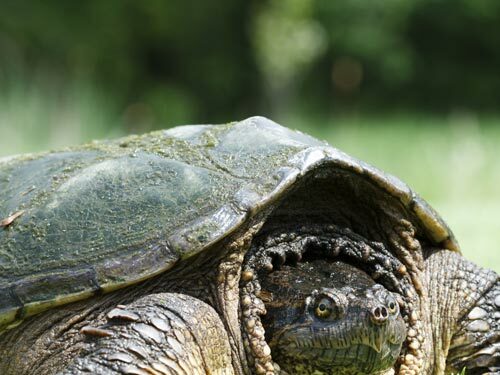 A snapping turtle ranges between 8-20 inches long, and it weighs between 8-35 pounds on average. The snapper's upper shell varies between shades of black, brown, olive green, and light green. The rest of a snapper's body is rough and bumpy. The snapping turtle is at home in the water, which includes freshwater, brackish swamps, lakes, ponds, rivers, and streams. It prefers slow moving, shallow waters with a muddy bottom. Near colder water, the snapping turtle will often hang out on rocks. The snapper is an omnivore and will eat aquatic plants, snails, frogs, snakes, bird eggs, fish, and if necessary, small mammals and water birds. Snapping turtles are mainly aquatic creatures, but are often spotted on land when in search of a new habitat or if a female is ready to lay her eggs. Snappers mate between April and November, but for the most part, females nest in early June. Female nesting sites are on land and in loose soil, sand, or even vegetation debris. The pregnant female digs a 4-7 inch deep nest, and then she lays 20-40 eggs the size of ping pong balls. The eggs are left to hatch on their own, which takes roughly 55-125 days. Temperature has an effect on the number of males and females, and more females are born in warm temperatures. Snapping turtles are currently not listed as endangered, but the snapper population in the Adirondacks does have its threats. Since females don't stay with the eggs, many hatchlings are targeted by scavengers, such as raccoons, skunks, snakes, and large birds. Adults snappers are at risk of being hit by a vehicle, particularly females that nest by a road. The loss of a pregnant female results in less turtles born, so conservation efforts have centered on building ideal habitats for turtles away from busy highways. The painted turtle is regarded as one of the most common species of turtle found in the Adirondack Park. The painted turtle is small, generally between 5-7 inches long with an average weight of .5-1.0 pounds. Female painted turtles are slightly heavier and larger than males in shell size. However, male painted turtles have long, front claws and a bigger tail than females. The painted turtle has olive green or black skin, and the smooth, upper shell is usually dark in color. Unlike the snapping turtle, the painted turtle has brighter colors as well. There are red and yellow stripes on its head, neck, and limbs, and sometimes red markings along the outer part of the upper shell. A lot of the time, painted turtles bask on rocks, logs, or stumps near or in lakes, ponds, and marshes because they prefer aquatic habitats. It's not uncommon to see painted turtles grouped together in a sunny location, or to see them on top of one another. Painted turtles are omnivores, and they feed on aquatic plants, insects, other very small invertebrates, and tadpoles. Painted turtles begin their breeding period between March and mid-June, and many females lay their eggs between May and June. Females dig a small nest up to a half-mile away from water in sand or soft land. An average of 5-6 eggs are laid, and the hatchlings are born in about 10 weeks. Warmer nests result in more females. While painted turtles aren't threatened by any major predators, they do face similar threats as other turtles. 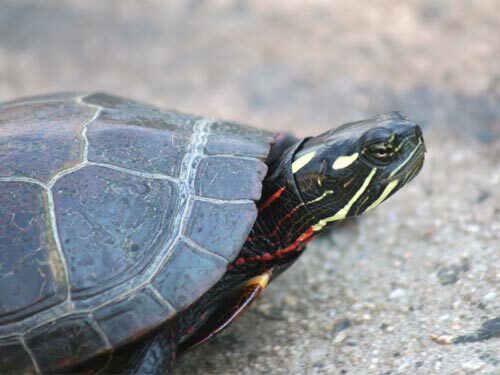 While crossing a road, painted turtles are at risk of being hit by a vehicle, but it's easier to help guide them along than it is to help a snapper. Furthermore, painted turtle nests are at risk of scavengers, such as raccoons. The spotted turtle is another easily recognizable turtle in the Adirondacks and New York State, but it is also a species of special concern due to loss of habitat and pollution. The length of a spotted turtle ranges between 3.5-5 inches, and the turtle weighs between .5-.75 pounds on average. The spotted turtle is sprinkled with yellow polka dots on its shell, neck, head, and limbs. Underneath, a spotted turtle is yellow with black splotches on the plates. Everywhere else, the spotted turtle is mainly black or dark brown. While the female spotted turtle has a yellowish coloration on its jaws, the male has a much darker coloration. The population of spotted turtles is smaller in the Adirondacks than in western or southeastern New York, but they are present in the western region of the Adirondack Park. Spotted turtles are semi-aquatic, and they prefer shallow wetlands, small moving streams, and muddy bottoms. 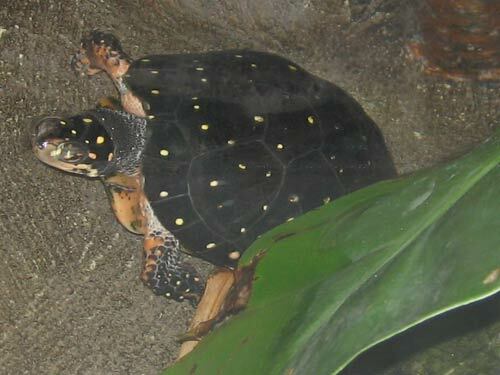 Similar to the painted turtle, the spotted turtle basks in the sun and is active during the day. The spotted turtle is an omnivore, and its food sources include insects, algae, aquatic and terrestrial plants, and small fish. The breeding season for spotted turtles is from March to May. In late May, females find a suitable location for a nest, such as a field, meadow, or any other soft, open area, and lay their eggs there. In the nest, a female spotted turtle usually lays 3-4 eggs, and then she smooths dirt over the top by dragging her body over it. It takes about 11 weeks for the babies to hatch, and then they travel to a wetland habitat. A cooler nest results in mostly males, and in warmer nests, mostly females. Spotted turtles are in decline, and their status as a species of special concern means they aren't endangered or majorly threatened, but evidence points to the fact that conservation efforts should be a priority. Indeed, local populations of the spotted turtle have been lower because of pet collecting and pollution. Spotted turtles are particularly sensitive to pollutants in the water, which harms the turtle and its habitat. Similar to other turtles, scavengers and vehicles are also a constant danger. Along with the spotted turtle, the wood turtle is an uncommon turtle in the Adirondacks, but it is still considered native to the region. A wood turtle reaches 5-9 inches in length, and adults generally weigh between 1.5-2.5 pounds. The wood turtle gets its name from the color and shape of its upper shell. The shell is brown and gray, and there are ring patterns on it that are similar in appearance to tree rings. The upper shell also has a sculpted appearance because each plate is slightly raised, which gives the wood turtle a bumpier shell overall. The wood turtle's lower shell is yellow with black markings on each plate. 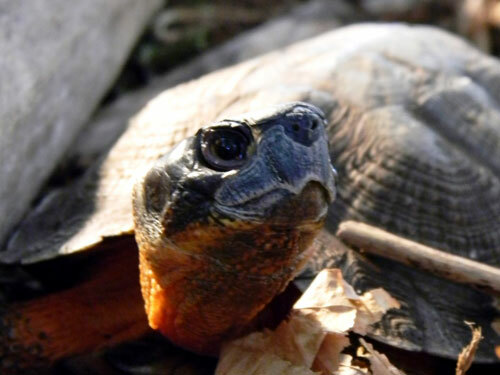 While the head is usually black, the other parts of a wood turtle can take on a yellow or orange hue. The wood turtle is also semi-aquatic and prefers fast moving water, such as rivers and streams. However, on land, the wood turtle forages in wooded or bushy areas. They roam between their aquatic and terrestrial habitats from late spring to early fall. Wood turtles are omnivores, and they will eat berries, mushrooms, small fish, worms, tadpoles, and algae. The mating season for wood turtles is from spring to early summer. Female wood turtles seek out soft soil and lay 4-12 eggs in a nest. Hatchlings are typically born in late summer or fall. The gender of baby wood turtles is not dependent on the temperature, instead genetics is the main factor. The wood turtle is another turtle species that is listed under special concern. Aside from the common causes of turtle population loss, including nest scavengers and vehicles, habitat fragmentation is a major conservation concern for the species. Since they prefer a wooded habitat, deforestation and urbanization both damage the areas where they live. Habitat loss forces wood turtles to travel and face greater risks around roads.